In some cases, MMA interest rates are tiered. If this is the case, I usually report the interest rate at the $10,000 tier in these updates. Rates are believed to be accurate as of 12/26/16. I did not include banks that had special, or introductory rates in the list because they are not ongoing interest rates. I am also not including non-liquid accounts such as CD's in the list. I have included one credit union in the list so that readers have a comparison point with banks. *I recently added Popular Direct which is from Banco Popular North America. I don't know much about this bank, but will note that they have a $5000 minimum to open an account, and will charge $4 each month if the account balance is less than $500. If anybody has experience with this bank, I would like to hear from you. Western Federal Credit Union has announced that they have changed their name to Unify Financial Credit Union. They said that all accounts and services are intended to remain the same after the name change. However, I did notice that they reduced their interest rate after the name change. up to 1% on everything else. This card replaced the Costco TrueEarnings Card from American Express on June 20, 2016. There is no annual fee, however you must be a Costco member. Ten years ago, the US real estate market began to fall after a long period of growth. Prices were falling for 31 months in a row. And in 2007, falling prices created mass panic on Wall Street, which dried out money markets and as a result, the banks started to cut lending, finally causing the crash in 2008. Ten years after, most of US banks are reorganized to withstand a disaster like the one in 2008. 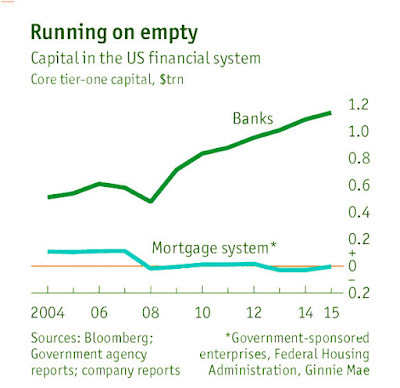 They now have the basic capital of over $1.2 trillion, which is 2 times more than it was before the crisis. Restrictive policies of banks to loan approval have cut their profits, so they had to find other ways to satisfy the shareholders. They did it by cutting costs and increasing prices, so they returned profit to 10%. At this moment, the banking sector is well capitalized with low profit and with high discipline. On the housing market, besides banks, exist other lenders which fulfill more than half of the demand for loans. Those participants are not so well capitalized as banks as they are small lenders that work with small profit. They are mostly nationalized and subject to administrative control. 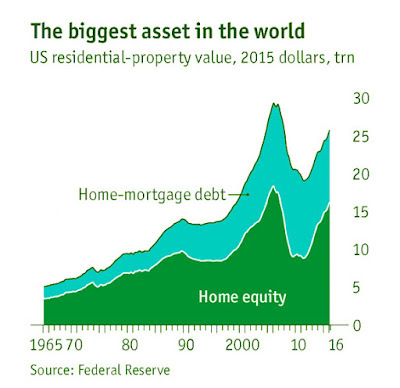 US housing has the biggest asset in the world, worth $26 trillion, and almost half of that amount is in the debt zone, making highest concentration of risk to investors. This debt has more implications on common people who are trying to buy their first house than on the investors. 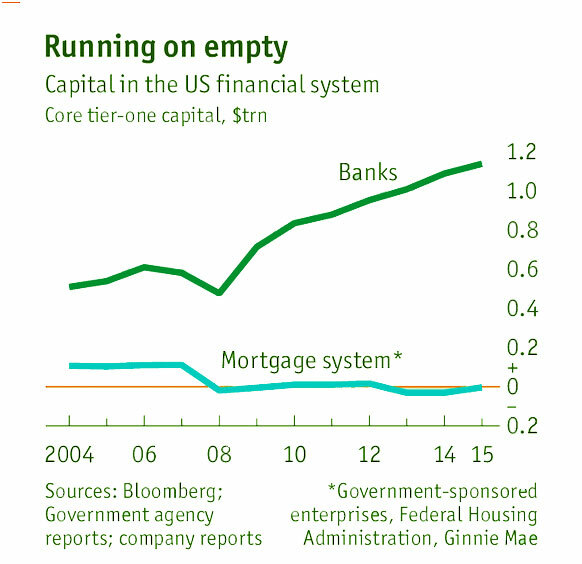 Situation now looks like this - about 70% of new mortgages are controlled by state institutions. Contrary to other countries, US housing system offers new buyers cheap 30 year mortgage loans which can be repaid early. This unique shielding system protects lenders and buyers. After 2008 crisis structure of mortgage owners is changed, banks were partially withdrawn from the market and that left a hole for new independent companies like Quicken Loans and Freedom Mortgage, which play more conservative game without risky loans. Besides that, the state has an important role since it took over majority of shares in Freddie Mac and Fannie Mae, mortgage companies which now work in a more conservative way. No matter how this new ownership structure helped the US real estate market recover from crisis, it still has numerous flaws. Regulation of new mortgage originators trough government guarantee companies is too loose, and a second even bigger danger lies in the fact that mortgage bonds were transformed from risky to safe ones since they are state-run bonds. Strict government policy caused drop in home ownership rates from 69% in 2008 to 63% in 2016 because the young don't have good wages to afford a new house. From 1990 to 2007, private sector recognized that and loosed the rules on what caused the increase in home ownership percentage. Now we can see the first signs of more relaxed system, but not in the measure it was. State granted us homogeneous mortgage bonds which are risk free and easy to trade in value of $200 billion each day, which might help a bit. There a lot of concerns because government is a key player, but after witnessing previous mistakes in governing of mortgage loans by private sector, we could say - leave it as it is. For now, debt-income ratio below 10% as a long term average is not causing new concerns. During the last couple of years, Forex trading has experienced a huge boost, resulting in almost five billion dollars of trade. And yes, we are talking about daily turnover! Of course, we can conclude based on these numbers that currency trading is extremely popular among the online investors. It is currently the fasted growing market in the world and a place which attracts more and more people from around the world. However, the experts at XTrade Europe warn that this doesn’t mean this business is not without any dangers and potential problems. It has more challenges that we can imagine. After all, we have to accept that currency investing is extremely turbulent activity which directly depends on many factors - from politics, over social events to ordinary gossips. As you already know, Forex is a market that never sleeps. It operates 24 hours, meaning that every time is potentially perfect for trading. And this might be a huge problem for the majority of traders. People usually are not able to find a fine line between their business (investing) and free time. Ordinary “brick and mortar” businesses have strict working time, allowing people to spend their free time in whatever way they want. It is not the case with Forex trading. Sometimes, it is almost impossible to know where business ends and private life begins. All XTrade Europe day-traders know what we are talking about. These people must react quickly and they do not have time for anything else. Because of all this, you just have to organize your life and see which options or trading style would be perfect for you. Maybe part-time trading is not bad at all. Think about it. We already said that many things could affect the currency market. It is not some isolated place, where can be applied strict rules and laws. It is a place that is full of surprises. This is the reason why many traders quit only after a few months. They just do not know how to deal with these surprises and strange movement in the local and regional economies. We cannot blame them. But, this is what Forex trading really is- a highly risky activity with uncertain outcomes. This is also the reason why we should consider dealing only with reputable online brokers, such as XTrade Europe, who can help us to find the light in the end of the tunnel. Of course, sudden changes do not mean we cannot predict events at all. Do not worry; with a proper knowledge and experience, you will find your way. Politics and economy are firmly connected with each other. So, if you notice even the smallest political crises in some part of the world, you can be sure it will affect the economy of this region, so as local currencies. If you want to continue trading on the Forex market with XTrade Europe, you will have to understand these political issues and learn how to turn them in your favor. Yahoo recently updated their Finance pages. And, there has been a lot of criticism of the new Yahoo Finance site. According to Yahoo, they "updated the Yahoo Finance homepage to have a fresh new look with bigger headlines and photos, an enhanced news stream, and consistent navigation at the top of the page." My biggest criticism is that the Yahoo Finance site seems to slow down my entire computer, not just that page. I don't want bigger headlines and photos, as I like to see more articles on one page without having to constantly scroll down. After every 3-4 articles is an advertisement that tries to blend in with the real news. The historical stock data display is messed up in Yahoo Finance. The column showing the adjusted close is not correct, and the column showing the actual close is missing. If you like the old features, I would suggest bookmarking the old Yahoo pages. There is no guarantee of how long they will still be available? So, what do you think of the NEW Yahoo! Finance site? My advice would be to don't fix what is not broken. In some cases, MMA interest rates are tiered. If this is the case, I usually report the interest rate at the $10,000 tier in these updates. Rates are believed to be accurate as of 5/25/16. I did not include banks that had special, or introductory rates in the list because they are not ongoing interest rates. I am also not including non-liquid accounts such as CD's in the list. I have included one credit union in the list so that readers have a comparison point with banks. I recently added GE Capital Bank has changed its name to GS (Goldman Sachs) Bank. By a small margin, GS Bank Online Savings retains the top position on this list yielding 1.05% APY. I've stopped using my Costco American Express card since it will be discontinued early in 2016. At this point, I have no need for an AmEx card since Costco will no longer accept it. In some cases, MMA interest rates are tiered. If this is the case, I usually report the interest rate at the $10,000 tier in these updates. Rates are believed to be accurate as of 3/21/16. I did not include banks that had special, or introductory rates in the list because they are not ongoing interest rates. I am also not including non-liquid accounts such as CD's in the list. I have included one credit union in the list so that readers have a comparison point with banks. I recently added GE Capital Bank to the list, and GE has announced plans to sell their online deposit accounts to Goldman Sachs Bank. By a small margin, GE Capital Bank Online Savings retains the top position on this list yielding 1.05% APY. Western Federal Credit Union has announced that they will change their name to Unify Financial Credit Union. All accounts and services are intended to remain the same after the name change. Online CFD trading is hard work. In this very daunting but exciting process, you’ll definitely need all the help you can get. Here are several tried and tested tips and strategies that will put you ahead of your competition. A big mistake made by beginners at online CFD trading is that they jump immediately into trading without thinking if they want to trade in real-time (meaning doing the work as the currency fluctuates every hour or day) or long-term (meaning focusing on big shifts in the prices). While this may be a good idea in order to take advantages of each and every opportunity, it can be time-consuming, not to mention tiring. It is pivotal that a trader must only focus on one specific type of trading. This will not only keep him focused on one goal, but it will also provide him the experience and learning he needs to become an expert at that specific field. For those who want to make a commitment to online CFD trading, our suggestion is to take the long-term route. This type of focus is more sustainable and will give you the breathing room you need to take a step back and analyze trends and patterns in the fluctuations. In the long run, it might even become a profitable venture. One mostly ignored strategy is swing trading. Swing trading refers to the process of take advantage of small fluctuations within larger patterns in the Forex chart. These are excellent opportunities for purchasing currencies as this usually means that the data is telling the user that the prices will continue to spike upwards. This is a good way to earn important and valuable currencies in a quick, intelligent and efficient manner. If you’re not a big risk taker, there’s always hedging. Hedging, in the CFD trading world, refers to the process of protective a specific position from a risky performance in the currency exchange rates. Hedging requires a close eye for detail. It requires analysis, and anticipating possible risks, and moving your currencies in order to protect it from potential losses. By doing this, you’ll be able to keep your assets safe for a long time. A lot of individuals in the online CFD trading world just buy and sell and repeat the process over and over without a clear regard for their startup capital. It is important for traders to hide some piece of capital away in order to ensure that they have a lifeline during desperate times. Losses happen in the online CFD trading world. It is unavoidable. Even the best traders have experienced it. Having a capital safe and protected ensures that you can start again even when you have lost all your currencies. These are but some of the many strategies you can use when dealing with online CFD trading. With a few more years, you can devise your own that’s going to give you an advantage over your fellow traders. In some cases, MMA interest rates are tiered. If this is the case, I usually report the interest rate at the $10,000 tier in these updates. Rates are believed to be accurate as of 1/27/16. I did not include banks that had special, or introductory rates in the list because they are not ongoing interest rates. I am also not including non-liquid accounts such as CD's in the list. I have included one credit union in the list so that readers have a comparison point with banks. I recently added GE Capital Bank to the list, and GE has announced plans to sell their online deposit accounts to Goldman Sachs Bank. By a small margin, GE Capital Bank Online Savings retains the top position on this list yielding 1.05% APY.